Non-western music is generally passed down from generation to generation through word of mouth. Notation is not as significant and improvisation is preferred. The voice is an essential instrument as well as various instruments native to that country or region. In non-western music, melody and rhythm are emphasized; musical texture may be monophonic, polyphonic and/or homophonic depending on the location. The drum, played either by hand or by using sticks, is an important musical instrument in African culture. Their variety of musical instruments is as diverse as their culture. They make musical instruments out of any material that can produce sound. These include finger bells, flutes, horns, musical bow, thumb piano, trumpets, and xylophones. Singing and dancing also play an important role. A singing technique called "call and response" is evident in African vocal music. In "call and response" a person leads by singing a phrase which is then answered by a group of singers. Dancing requires the movement of various body parts in time to the rhythm. African music has complex rhythmic patterns and the texture can be polyphonic or homophonic. "Ompeh" from central Ghana represents African music because of its use of percussion instruments. This piece has several different rhythmic patterns and uses “call and response.” This singing technique is evident in African vocal music, wherein a person leads by singing a phrase which is then answered by a group of singers. Ompeh is homophonic in texture and uses various native instruments such as idiophones (i.e. metal bells) and membranophones (i.e. bamboo slit drum). The solo melodies alternate with the chorus. Just like African music, the music of India is passed down through word of mouth. However, India has different systems of music notation, but it is not as detailed as Western music. Another similarity of Indian music with African music is that both give importance to improvisation and vocal abilities; they also use drums and other instruments native to that location. Note patterns of a melody called raga and pattern of beats that are repeated called tala are also characteristics of Indian music. "Maru-Bihag" represents the music of India. The particular interpretation on the CD accompanying Kamien's Music An Appreciation (6th Brief Edition) was an improvisation by Ravi Shankar. 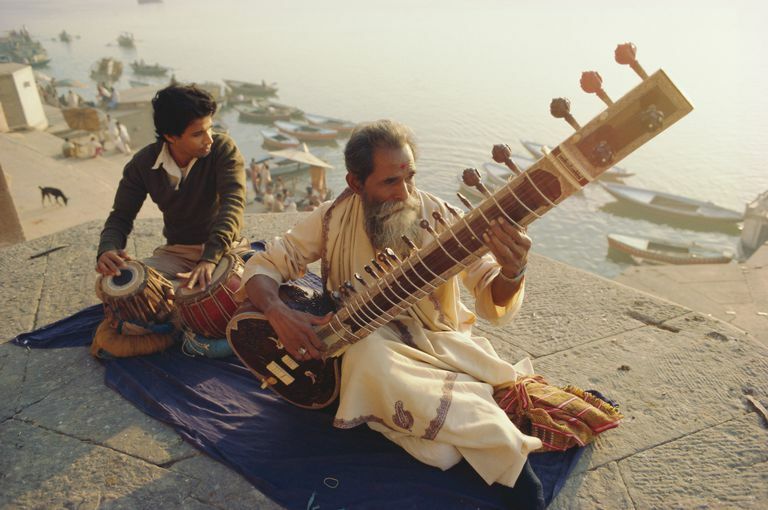 Improvisation is one characteristic of Indian music. The instruments strive to imitate the vocal styles with its ascending and descending melodies. Another characteristic of Indian music evident in this piece is the use of a drone instrument (tambura). The sitar is used as the main instrument. The melodic structure or pattern of notes used in this piece is known as the raga. The rhythmic structure or the cycle of beats that are repeated is called tala. Early Polynesian music is described as chant-songs; vocal music that is chanted using simple to elaborate melodies. These chant-songs were a part of daily life. When American and European missionaries came, they brought with them a type of music called hymns wherein the melodies are sung by several voice parts; this influenced Polynesian music. Instruments commonly used in Polynesian music are drums played by hand or by using sticks. An example of this is the slit-drum which looks like a small canoe. Polynesian dancers are fascinating to watch. The words and melody of the song are illustrated through hand gestures and hip movements. The rhythm of the music may either be slow or fast; the music emphasized by stomping of the feet or clapping of hands. Dancers wear colorful clothes that are native to each island such as grass skirts and leis are worn by Hawaiian hula dancers. What Is Son Cubano Music?